As I traveled back home today in Singapore’s incredibly efficient metro, I felt a pang of homesickness as I watched everyone around me staring into their iPhones, oblivious to the sea of humanity surrounding them. At that moment I realized that what I really missed was the great amount of human interaction that travelling in Bangalore involves – especially my hour long auto rides back home from work every day. Though Bangalore’s auto drivers have often been portrayed as villains meandering Bangalore’s streets, I have a very different opinion and recall my encounters with them rather fondly. Every evening I hailed an auto in front of Forum in Koramangala, and residing in an obscure part of Bangalore meant that it wasn’t always easy to get a ride. One rainy, lovely day in Bangalore I was unsuccessful in getting an auto for over 20 minutes, when my auto in shining armour, driven by Karthik, stopped by and agreed to give me a ride home. Frustrated by then, I spewed my anger at his brotherhood and told him that they were all insensitive and cruel. He immediately turned around (ignoring the road in front as they so often do) and in Kannada told me, “Madam, if anyone in this auto stand ever refuses to drop you home when it is raining, just give me a call. I will make one call and you have somebody getting you home safely. My promise.” I never waited for an auto on another rainy day. Some of my other encounters have been more amusing than touching. I remember being exhausted from a particularly hard day at work, and as it often does, my dark circles screamed out for attention. At the first signal we stopped at, the auto driver peered at me through the mirror and asked “Tired, Madam?” I replied in the affirmative. “What you need, madam, is a glass of juice” he replied, “and there is this place close by where you get very good juice, excellent” he continued. Before I could answer, he had made a sharp 90 degree turn into a by-lane, moving from the extreme right of the road to the extreme left, blissfully oblivious to all the vehicles behind screeching and swerving to avoid a collision. Shocked, I asked him where he was going. “This is where you get the juice” he said, calmly. I began to decline vehemently, saying I just wanted to get home. “But I’ll buy!” was his bewildered response as I sighed in resignation. There are all kinds of autos on Bangalore’s streets. The most eye catching are the “disco” autos. Even if you’ve never been in one, you’ve probably seen it. Its interiors would make an LMFAO video pale in comparison, what with its dazzling rotating, blinking, dancing light changing from blue to red to green rapidly. Huge speakers adorn the back of the auto, belting out loudly tunes from the latest Puneeth Rajkumar or Darshan movie. One exceptional example of a ‘disco” auto was one that I saw was fitted with a large colour screen by the side of the auto. As I began to take in my jatang surroundings, the driver asked me if I wanted to listen to English, Hindi or Kannada music. Thoroughly fascinated by now, I said English. Next thing you know, I saw Enrique wooing his “Dirty Dancer” on the screen with spectacular sound quality, with all the lights obliging to the dancey beats. After some probing, he told me that his intention was to be different and make his passengers as happy as he could and didn’t mind the additional cost incurred if these purposes were met. As I got off, he told me proudly that his auto had been featured on a news channel and a Facebook page. Perhaps my most bizarre auto ride was on a rainy day back home. Just as I settled in and began to slowly doze off, a shrill whistle jolted me awake-the kind of whistle that sent a shiver down your spine in school when the PT master blew it behind you. I sat up and looked around, to see one of those lethal sound instruments hanging loosely on the auto driver’s lips. Before I could open my mouth to ask what the hell he was doing, he began to blow at it vigorously, causing all the two wheeler riders to turn back startled, while they scurried to make way for us to pass. Some continued to stare after making way, amazed at what they were hearing. A few laughed uncontrollably, and I sat red faced and thoroughly embarrassed. Soon, the hilarity of the scene got to me as well and I chuckled and smiled at everyone who stared and pointed at the auto I now proudly occupied. Turns out, there was absolutely nothing wrong with the auto’s horn. My driver was simply of the belief that Bangalore’s roads needed much more than a horn, and told me with utmost conviction that in his auto, you won’t have to wait in a traffic jam for longer than 15 seconds. “Look at your watch, madam. Never. It will never happen. You see”. And sure enough, it didn’t. These are just a few incidents that I will never forget. There was also the one who asked me riddles throughout the one hour journey, a Muslim driver who insisted on discussing Hindu philosophy with me, the one who told me shyly that he thinks I resemble Aishwarya Rai (slightly creepy, yes), the one who yelled over the din to tell my mother (who was at the time talking to me on the phone during a riot scare) that he promises to get her daughter home safely, the one who told me to “chill, madam..” when I told him I had no change to pay with…the list goes on. Agreed not all of Bangalore’s auto drivers are beautiful souls. But that’s true of any set of people- the few bad ones give them all a lousy reputation. I choose to remember my Bengaluru’s auto drivers with fond memories- for giving me a much needed break from mundane office days, for giving me a dose of reality and grounding at the end of every day and for having enthusiastic conversations despite a long hard day of driving. 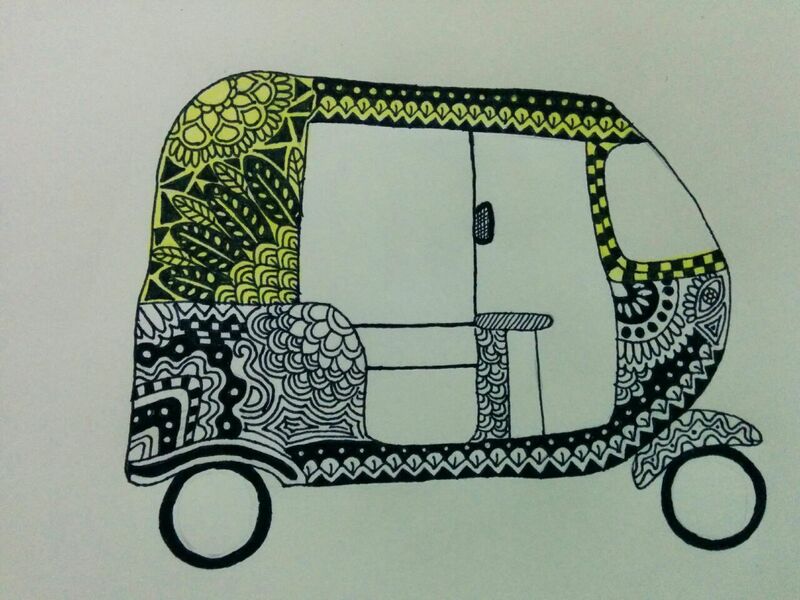 And now, I look forward to visiting my favourite city and taking an auto ride very soon. Maybe even buy one of them a glass of juice!